I have been a fan of crime novels, especially the sub-genre of cozy mysteries for some time now. So it's perhaps a bit remiss of me to have read almost nothing from Agatha Christie. Up until now, I had only really read the first novel and some short stories from her Hercule Poirot series. I remember liking the writing, but found Poirot and Hastings less than engaging as protagonists. So I just never got round to reading anything else of hers. 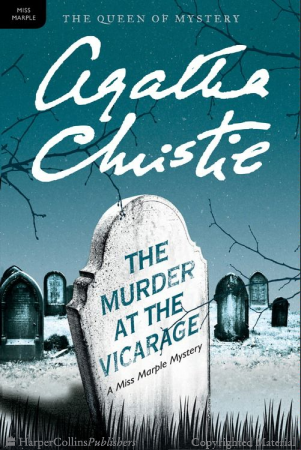 But my mum has always recommended the Miss Marple series to me, so when I saw The Murder at the Vicarage, I figured that I had nothing to lose through trying it. In a careless comment over dinner, the parson of St Mary Mead expresses his frustration at one of his parishioners by stating that whoever murdered Colonel Protheroe would be doing the world a service. So it is with more than a little chagrin when the Colonel is found dead in his study only a day later. While the parson works with the police to try and bring the murderer to justice, he finds that his elderly neighbour, Miss Jane Marple, may be a little sharper than the rest of them put together. I feel a bit torn about The Murder at the Vicarage as a novel. On the one hand, the mystery has almost everything that I like about cozy mysteries present and accounted for. There's the village setting that is just a little more unnerving than it is inviting, populated mostly by nosy, gossiping old women and the unfortunate people who must deal with them. There's the victim who was more or less disliked by everyone who knew him, including his wife and daughter, though the reader doesn't really see enough of him alive to make much of an impression of him. The mystery itself is engaging and much more devious and misleading than I initially gave it credit for. And the writing is wonderful, with some unexpected instances of humour. So far, so good. On the other hand, it is the final element that I look for in a cozy mystery that was somewhat lacking, and the fact that it's lacking at all confuses the hell out of me. Considering that it is the first in the Miss Marple series of mysteries, I was expecting Miss Marple to be there a lot more than she was. I mean, I liked what I saw of her very much: the kind of old lady that is perfectly pleasant and unassuming in manner, but who you cannot get anything past, much as you try and hide it. As such, I was rather disappointed that she didn't appear for more than half of the actual novel itself. I mean, she does start to turn up more often towards the end, but until then it doesn't really feel like she's really playing a huge part in her own novel. I wouldn't say it's a complete dealbreaker, but if you don't like the parson then you are really in for a bad time, seeing as he's our narrator. I personally found him a bit colourless, but otherwise inoffensive. If it were any other genre, or if I weren't aware that this is Miss Marple's show, then I would have preferred a narrator with a bit more personality to him, but as it was I wasn't overly concerned.